SINGAPORE (AP) — Leaders of Southeast Asian nations have again pushed back an agreement on a pan-Asian free trade deal amid a whirlwind of diplomacy Wednesday at their annual summit. In convening talks among the leaders of countries participating in the plan, Singapore Prime Minister Lee Hsien Loong said a final agreement on the deal, which is expected to encompass nearly half the world's population and 40 percent of world trade, will be delayed until 2019. SINGAPORE (AP) — A cyberattack on Singapore's public health system breached records on 1.5 million people and targeted the prime minister, a two-time cancer survivor, officials said Friday. "The attackers specifically and repeatedly targeted Prime Minister Lee Hsien Loong's personal particulars and information on his outpatient dispensed medicines," the Ministry of Communications and Information and the Ministry of Health said in a joint statement. It's the summit eve in Singapore. Global anticipation of the meeting between U.S. President Donald Trump and North Korea's third-generation autocrat Kim Jong Un is close to feverish. It's the biggest, and most mind-boggling, summit of its kind this century — and probably for several decades. Trump arrived at the Istana, Singapore's government house, shortly before noon. WASHINGTON (AP) — President Donald Trump is thanking the prime minister of Singapore for agreeing to host his upcoming summit with North Korea's Kim Jong Un. 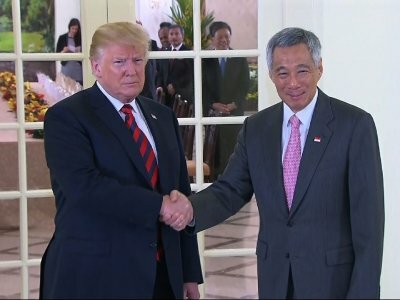 The White House says the president spoke Friday by phone with Singaporean Prime Minister Lee Hsien Loong (lee shyehn loong) and thanked him for his willingness to host the June 12 meeting. The two leaders also discussed regional security issues and reaffirmed their countries' partnership. NEW DELHI (AP) — Southeast Asian leaders are gathering in New Delhi to celebrate their countries' ties with India, though the meeting comes amid confusion about the repatriation of Rohingya Muslims who fled Myanmar violence by the hundreds of thousands. They received a ceremonial welcome to kick off a visit to the Southeast Asian island nation in which they will have an orchid named after them and be hosted at a state banquet by Singapore's president, Halimah Yacob. WASHINGTON (AP) — Singapore's prime minister has raised doubts over the Trump administration's trade policy, saying a hasty push to get countries to open their markets may "come to grief." Prime Minister Lee Hsien Loong said the U.S. withdrawal from a trans-Pacific trade agreement had hurt U.S. credibility in negotiations and many countries will be reluctant to enter one-on-one trade deals with Washington. The Boeing Co. signed a $13.8 billion agreement Monday at the White House to sell 39 jetliners to Singapore International Airlines, a deal that President Trump said will create 70,000 jobs in the U.S.
"Otherwise we'll cancel the order," Mr. Trump joked. 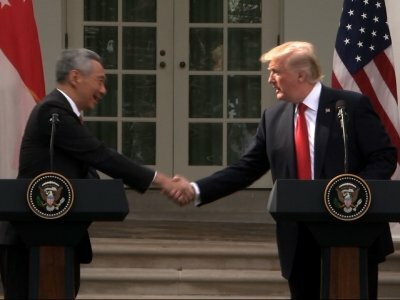 The deal had been announced previously, but Mr. Trump hosted the event in the Roosevelt Room to emphasize the strength of the U.S.-Singapore economic and national security ties as he prepares for a nine-day trip to Asia. President Trump discussed North Korea's nuclear threat Monday with the prime minister of Singapore, with the Asian leader acknowledging there are "no quick and easy" solutions. 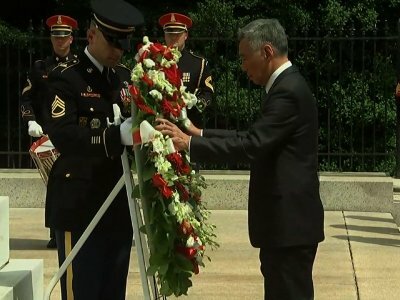 At a White House event in the Rose Garden, Prime Minister Lee Hsien Loong said his country shares with the U.S. its condemnation of North Korea's "dangerous provocations." "Pressure is necessary, but so is dialogue," Mr. Lee said. SALT LAKE CITY (AP) — Utah's governor is leading a trade mission in Singapore and Vietnam this week. Gov. Gary Herbert flew to Singapore on Thursday and will remain there until he heads to Vietnam on Tuesday. The trip is hosted by the World Trade Center Utah and includes meeting with Singapore Prime Minister Lee Hsien Loong, other government officials and business groups. BANGKOK (AP) — Thailand's prime minister has accepted an invitation from President Donald Trump to visit the United States, his office said Monday, as the U.S. leader made an unexpected diplomatic initiative toward several Southeast Asian counterparts. SINGAPORE (AP) — Singaporean Prime Minister Lee Hsien Loong, hosting a visit by his Israeli counterpart, Benjamin Netanyahu, said Monday his country believes in a "two-state solution" to the Israeli-Palestinian conflict. Lee explained his stand at a joint news briefing with Netanyahu, who does not endorse the two-nation approach. Lee said he realizes a two-state solution is difficult to achieve, but said it is the only way to achieve peace. SINGAPORE (AP) — Nine armored personnel carriers belonging to Singapore that were seized in the Chinese territory of Hong Kong will be returned, officials said Tuesday. The Singapore Ministry of Foreign Affairs said Prime Minister Lee Hsien Loong received a letter from Hong Kong Chief Executive Leung Chun-ying saying that Hong Kong had completed an investigation of the SAF Terrex infantry carrier vehicles and other equipment and would release them to the Singapore government. CANBERRA, Australia (AP) — China should not see increased military cooperation between Singapore and Australia through a deal that will dramatically expand northern Australian training facilities as an attempt to contain it, the two prime ministers said on Thursday. Australian and Singaporean officials signed a pact under which Singapore will spend up to 2.25 billion Australian dollars ($1.7 billion) to double the capacity of its facilities in military training areas in Queensland state. CANBERRA, Australia (AP) — China should not see increased military cooperation between Singapore and Australia through a deal that will dramatically expand northern Australian training facilities as an attempt contain it, the two prime ministers said on Thursday. CANBERRA, Australia (AP) — Singapore's prime minister visited Australia on Wednesday to upgrade a free-trade agreement and to finalize a deal that will double the capacity of Singaporean military training facilities in the Australian tropics. Singaporean Prime Minister Lee Hsien Loong told the Australian Parliament that China was the biggest trading partner of both nations, which were also allies of the United States. World leaders from 20 industrial and emerging-market nations are arriving in the southern Chinese city of Hangzhou for a summit starting Sunday. Among the latest arrivals Saturday morning are Canadian Prime Minister Justin Trudeau, who has already visited Beijing and Shanghai on a state visit, and U.N. Secretary-General Ban Ki-moon. SINGAPORE (AP) — Prime Minister Lee Hsien Loong posting Instagram photos? Interesting, but not unusual. He does it all the time. But Singapore's leader posting them from inside the White House, on the official presidential residence account? Now that's a different story. WASHINGTON (AP) — President Barack Obama found common cause with the leader of Singapore in the face of growing political headwinds against the Trans-Pacific Partnership, warning that to "pull up a drawbridge" on trade would only hurt the United States and its workers. WASHINGTON - President Barack Obama will use a visit from the prime minister of Singapore on Tuesday to launch a final public campaign for a landmark Asia Pacific trade accord, but proponents are losing hope that deal can survive the strong, anti-trade rancor among fellow Democrats. WASHINGTON (AP) — American credibility is on the line over the Trans-Pacific Partnership, Singapore's prime minister said Monday, urging its ratification despite growing political opposition in the U.S. to the 12-nation free trade pact. Prime Minister Lee Hsien Loong acknowledged that the TPP was politically difficult in a tough election year because of American people's worries over jobs and competition from overseas.